Elements Applied: Fruits, leaves, and flowers are applied in herbal medicine. Active Components: Hawthorn berries, flowers, and leaves include a range of compounds based on bioflavonoids, which take responsibility for the effect the remedy produces on the cardiovascular system. Bioflavonoids, present in the herb, are represented by hyperoside, quercetin, vitexin, and OPCc (oligomeric procyanidins). Due to the fact that these components are effective for cardiovascular conditions, plant’s flowers and leaves were made into extracts. History: In ancient Greece, Dioscorides applied Hawthorn for a range of conditions. After that it had been forgotten for a certain period, until an Irish herbalist used it as part of a unique medicine for heart conditions in the 19th century. Long after, it was discovered to contain hawthorn berries, and till now these berries are recommended by traditional herbalists for a range of heart conditions, including tachycardia and elevated blood pressure. Used For: The range of conditions, in which the herb is employed, includes high blood pressure, congestive heart failure, atherosclerosis, and angina pectoris. The plant is additionally known to relieve spasms, treat heart diseases, calm the nervous system, and widen the vessels. The plant is suitable for treating both low and high arterial tension, as it stimulates proper heart functionality. It is beneficial for a variety of conditions, associated with irregular blood pressure. Tea made of it is employed for insomnia and anxiety. The herb is characterized by a range of positive actions, imposed on heart. It dilates the arteries, supplying the heart, enhancing blood circulation. It improves pumping capacity, and inhibits a variety of arrhythmias. Additionally, it decreases the amount of cholesterol, accumulating in the arteries. German pharmaceutical producers offer over three dozen medicines for heart conditions, which include hawthorn as a component. Hawthorn belongs to the most popularly employed heart medicines. The herb is recommended by German doctors to stabilize heart rhythm, prevent the possibility of angina strokes, and impede cardiac diseases in senile patients, suffering from pneumonia and influenza. However, it should be mentioned that hawthorn needs a certain period of time to take action. To produce an immediate effect, take a traditional chemical medicine like nitroglycerin. Moreover, a heart disease of any kind should be monitored by a health-care provider, so self-treatment is not recommended. Additional Info: Hawthorn is a tree or a bush indigenous to Europe and Britain. It is a popular hedge herb. The stem is covered with woody surface, bearing ash bark and branches with thorns. The glossy and small leaves are greenish at the lower side, being deep green on the surface. The blossoming period lasts from late spring to early summer, when white flowers appear in terminal corymbs. The fruit contains 2-3 seeds, and is scarlet-colored on the surface. Preparation and Intake: Most commonly hawthorn medicines standardized to oligomeric procyanidins (19%) or bioflavonoid concentration (2.2%) are applied. The usual dose is 80-300 mg of the extract in tabs or capsules twice or thrice a day, or in form of tincture at a dose of 4-5 ml thrice per day. In case conventional berry medications are applied, the suggested dose is a minimum of 4-5 grams a day. 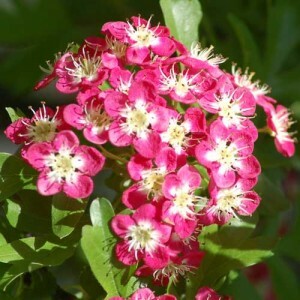 Hawthorn needs a certain period (1-2 months) to take action, and is utilized as a prolonged treatment. In Germany hawthorn tincture is prescribed for a couple of weeks at a dose of 1 teaspoon before night sleep. To relieve the bitter taste, the tincture can be aided by lemon, honey, or sugar, or added to a herbal drink. To prepare an infusion, take 2 teaspoons of pounded fruits or leaves and fill them up with 250 ml of boiling water. Infuse for twenty minutes. Consume at a dose of 2 cups a day. Safety: The herb can be safely used for a prolonged period. It is also compatible with the majority of cardiac preparations and other medicines. The herb can be safely applied by breastfeeding or pregnant women. Large hawthorn doses may result in a considerable decrease in blood pressure, which may potentially lead to faintness. According to FDA listings, hawthorn’s safety is still unknown.